Mothercare began as a retailer over fifty years ago and has gone on to become the most well-known stores for parents who want to purchase the necessary items to raise a child through pregnancy and into their teenage years. An incredible 91% of pregnant women shop at Mothercare with many continuing to frequent them long after their child was born. There is a fine array of Mothercare changing tables which come in a range of styles. What Baby Changers Do They Offer? Mothercare changers range from the simple to the more elaborate. The Ashton Changing Unit, made from natural pine has a simplistic edge over other models. Designed to look like a simple shelf unit, which can be purchased as part of a set, it has three levels. On the top level, a changing mat will fit effortlessly onto this sturdy changer, whilst on the bottom two levels there is enough storage space to put all the materials relating to changing a baby's nappy. Their neutral style means they can double up as a shelving unit once the infant grows too old. The Jamestown model is made from pine and is coloured white. The top level is surrounded by a wooden frame which can house a changing mat and keep it in place, making it a safe piece of furniture. Underneath there is a drawer which can hold all kinds of nappy chaining accessories and further down there is a spacious cabinet. This dresser can be used as a cabinet once the baby has outgrown it. Set on a cream background, these pictures bring life to the unit, so they blend in with similar decorations in an infant's nursery. The Tutti Bambini units are all immobile but they have a sturdy structure. 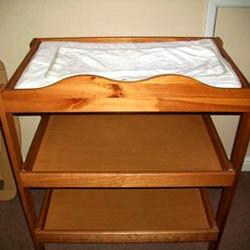 The top level has a raised wooden structure where a changing mat can be placed and secured. Underneath there is a large drawer to hold baby materials, with three smaller drawers below, alongside a larger cupboard space. What is the price range of the changing tables at Mothercare? The cost of the Mothercare changing tables vary between £59.99 and £249.99. The changers are the cheaper option with the dressers more expensive. All changing tables will be delivered for free to the customer's home, and come with a warranty ranging from 1 year to 5 years, depending on the unit.